16 years in the making set the scene for a tense re-match on Wednesday April 11th 2018, pitting Skiers VS Snowboarders in the Mountain Life Media event spectacular - Battle of the Blades 2018. Simulcast LIVE on 101.5 Whistler FM with your hosts', Feet Banks and Brett Tippie, this was no ordinary hockey game - it was an all-out, end to end, power infused, chippy BATTLE for supremacy on-ice!!!! In the end, at the end of 60 minutes of regulation play - some kids hockey during the 1st intermission, a puck toss, and a 50/50 worth nearly $200, the 2018 Battle of the Blades was won by.... the Skiers, with a score of 5 to 4. 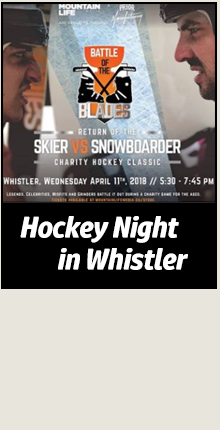 Battle of the Blades 2018 on Whistler FM - Hockey Night in Whistler.